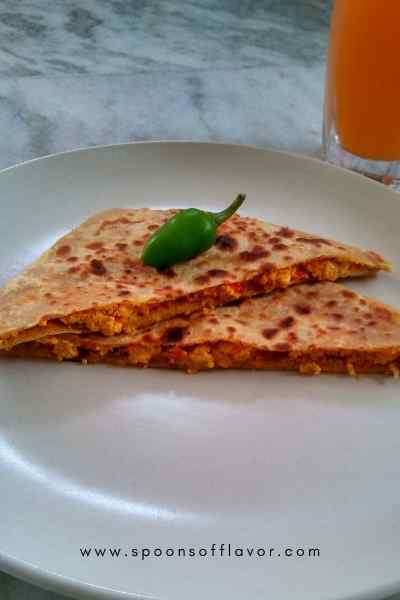 Paneer bhurji paratha is a light, healthy and filling dish served in breakfast or brunch. It is basically an Indian flatbread prepared mainly with whole wheat flour and scrambled cottage cheese. Paneer is a good source of protein. The low fat paneer is nothing but a cottage cheese made with low-fat milk. Low fat paneer provides a healthier alternative to the high-fat version. Therefore it is mostly preferred by dieters. 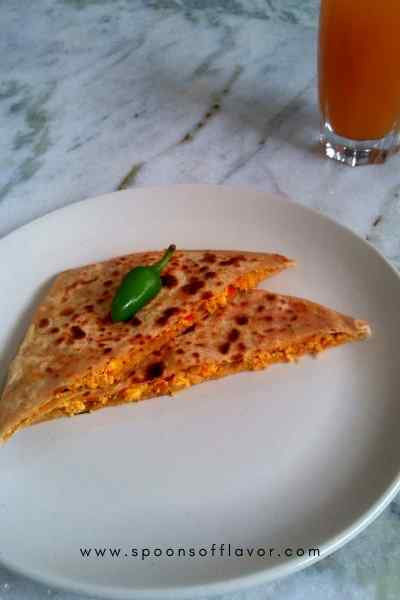 To make this paneer bhurji paratha I have used my homemade paneer. Homemade paneer is always the best both in taste and texture. This dish is a wholesome meal in itself. It can be eaten without any accompaniment. So it is a good option for the lunchbox or long road trip. It can also be served with green chutney or yogurt. 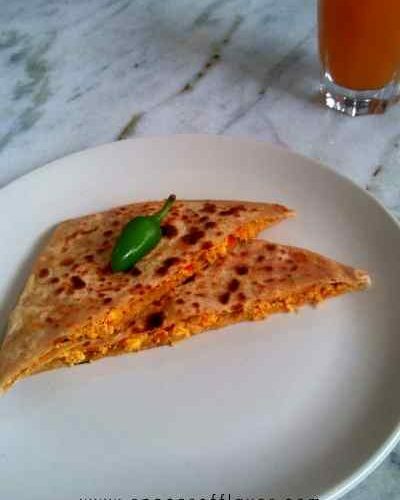 So let’s see how to make this paneer bhurji paratha recipe. Heat oil in a pan. Once oil becomes hot enough add chopped onion. Saute over medium flame until lightly golden. Add turmeric and red chili powder. Mix well and immediately add ginger-garlic paste. Saute for 2-3 minutes or till the raw smell goes. Add chopped tomatoes, chopped green chili, and salt. Stir well. Cover and cook for 1-2 minutes or until tomatoes become mushy. Check in between. Add garam masala powder and kasuri methi. Saute for some seconds. Add scrambled paneer. Saute and let it cook for 1-2 minutes..
Add water little by little at a time and simultaneously knead it into a soft dough. Take a dough, dust some flour and roll the dough into a circle with the help of a rolling pin. Put a tablespoon of paneer bhurji on the center and slightly spread it. Now fold from 4 sides and make a square like shape. And slightly roll just to seal up the folds. Heat a tawa. Add one rolled bread. Cook it over medium flame for some seconds. Brush oil on the top. Then turn it over and cook for few seconds and again brush oil on top. Change the sides for 1-2 times more or until both the sides become golden and light brown patches appear. Follow the same process to make all parathas. Serve hot or warm with some yogurt or green chutney.